Vancouver, British Columbia – July 11, 2018 – GGX Gold Corp. (TSX-v: GGX), (OTCQB: GGXXF), (FRA: 3SR2) (the “Company” or “GGX”) is pleased to announce the receipt of the additional analytical results from the winter-spring diamond drilling program on the Gold Drop property, located near Greenwood, B.C. 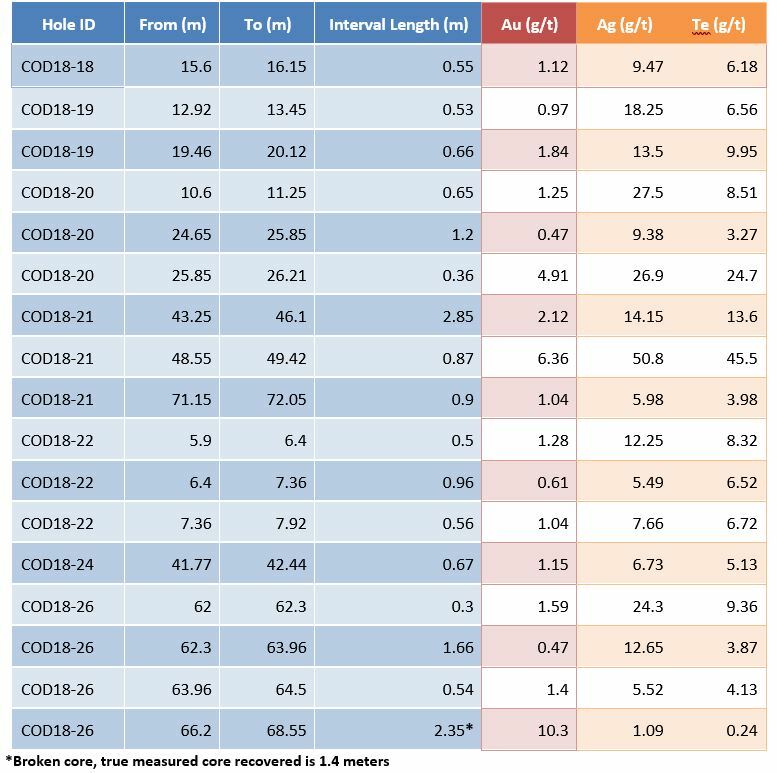 Drill core analytical results have been received for 2018 drill holes COD18-17 to COD18-26 which tested the COD Vein. Highlights from these analytical results include 6.36 grams per tonne (g/t) gold, 50.8 g/t silver and 45.5 g/t tellurium over 0.87 meter core length in hole COD18-21 and 10.3 g/t gold over a 2.35 meter interval (1.4 meters actual recovered core from the 2.35M Interval) in hole COD18-26. Drill hole COD18-26 intersected gold bearing veins approximately 30 meters southwest of the 2017 trench. This hole was drilled approximately 100 meters southwest of 2017 drill hole COD17-14. Hole COD17-14 intersected the 4.59 g/t gold over 16.03 meters, including 10.96 g/t gold over 5.97 meters (News Release of September 7, 2017). The ongoing diamond drill program is being conducted in the Gold Drop Southwest Zone, testing and defining the COD Vein, a Dentonia/Jewel style quartz vein. Drilling is also ongoing at a separate gold bearing vein in this region, referred to as the Everest Vein. 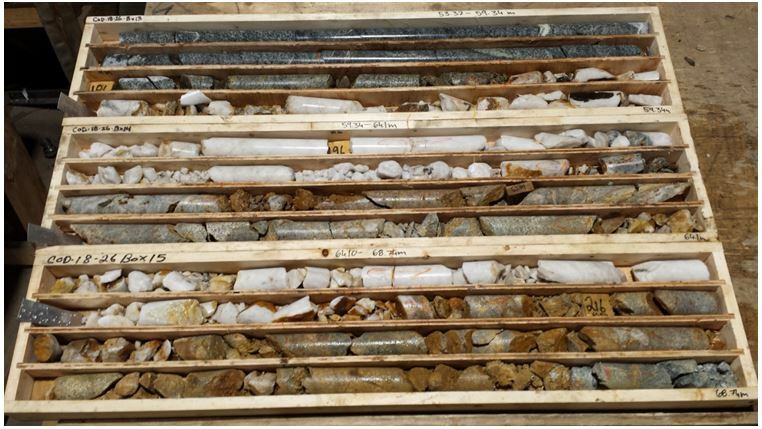 Previous drill core analytical results from the 2018 drilling program are reported in News Releases of May 29, June 4 and June 27. The highlight of the 2018 drilling program to date is 14.62 g/t gold, 150.2 g/t silver and 102.0 g/t tellurium over 2.1 meter core length in hole COD18-3 at the COD Vein. Trenching during 2017 exposed the northeast – southwest striking COD Vein for over 160 meter strike length. The analytical results listed below are highlights from holes DDCOD18-17 to DDCOD18-26, testing the COD Vein. Since true widths cannot be accurately determined from the information available the core lengths (meters) are reported. The Gold, Silver and Tellurium analyses are reported in grams per tonne (g/t). The intervals listed in the table below are from the gold, silver and tellurium bearing vein and / or adjacent low grade mineralized host rock. 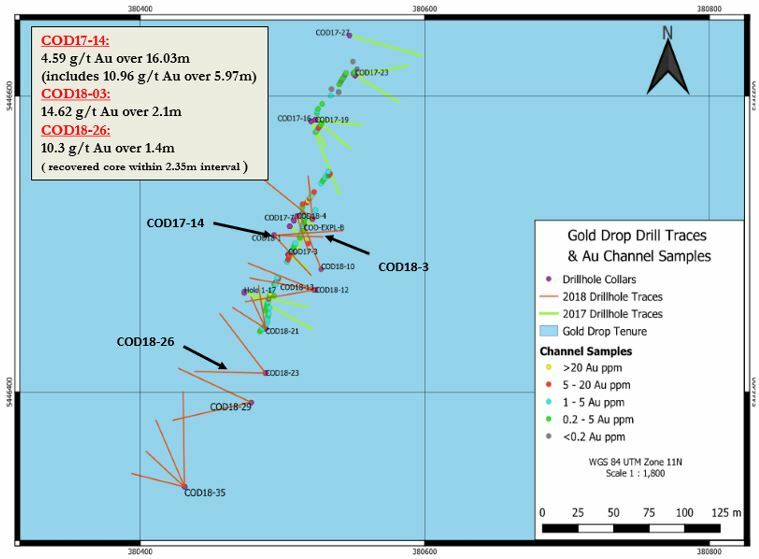 Drill holes COD18-17 through COD18-26 of the 2018 drilling program tested under the southern part of the 2017 trench and further south of the 2017 trench, targeting the COD Vein. The holes south of the trench tested the continuation of the COD Vein south-southwest of the 2017 trench. Drill core is being geologically logged and sampled at the Greenwood facility. Drill core is sawn in half with half core samples submitted for analysis and remaining half core stored in a secure location. Core samples were delivered to the ALS Minerals laboratory in Vancouver to be analyzed for gold by Fire Assay – AA. The samples are also being analyzed for 48 Elements by Four Acid and ICP-AES / ICP-MS. Quality control (QC) samples are inserted at regular intervals.